Featured: CatTipper Reflects on Seven Days Without the "Magical Fridge"
Today marks the end of our seven-day #FridgeChallenge, the challenge put forth by Freshpet to bloggers to live without the refrigerator for seven days. (Pets were exempt from the challenge but we weren’t allowed to use the refrigerator for our own items.) How did it go? Well, let’s just say we are VERY glad it was only a seven day challenge! It seemed much longer… We didn’t go hungry but we didn’t enjoy our usual fare, which typically is heavy on proteins and light on carbs. Instead, we found ourselves relying on shelf stable foods including boxed and canned foods. They weren’t as tasty as our usual meals, and they certainly weren’t as nutritious. The challenge really made us think about pet food, which is often either kibble or canned. We know that pets enjoy fresh food just as we do…and we enjoy the health benefits that they receive from it! To learn more about CatTipper and their Fridge Challenge week, be sure to view their website here. 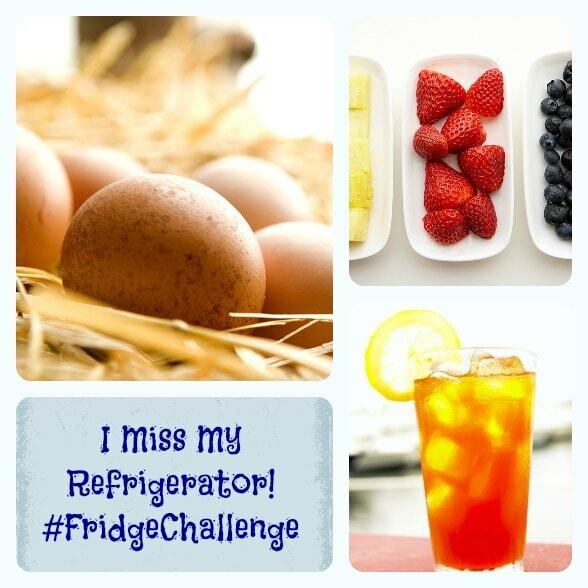 Yesterday, we shared 10 things we miss about our refrigerator as we’re taking the Freshpet #FridgeChallenge. They were annoyances and irritants but I know that, in a few days, we’ll be able to once again open those magical doors on the frosted world that awaits inside the refrigerator. In the meantime, however, I have gained nearly two pounds since the #FridgeChallenge began. While the annoyances of life without a fridge will be behind me, this weight will not and I’ll have to work to lose it. Our life without a refrigerator has revolved far more around boxed foods than fresh foods. As I mentioned in our Day One post, we live in the country, far from our local grocery store. Running to the store for the day’s meats, fruits and vegetables just isn’t an option for us. We’ve had to resort to canned and boxed foods. Foods that have more grain. Foods that are less nutritious. Foods that, we hate to admit, are much like the dry foods that so many of us feed our cats. This week, we’ve prepared canned meats and boxed dinners alongside a few vegetables, like potatoes, that can survive on our countertop this week. The temperature is still hot here (97 degrees yesterday) so refrigeration is essential for many fresh foods that, instead, we’ve just had to skip this week during the Challenge. One trick I have done is to pull out my dehydrator to dry some fruits (I love dried bananas and they make a great snack). Other than the dried fruit, though, I’ve been relying on many less nutritional options for our meals and snacks. Tonight, we’re having a casserole of canned chicken, cream of chicken soup, and dried pasta. Unlike our usual fare of fresh meat, fresh vegetables, and fruit, it’s a heavier meal (and this heavier dinner is resulting in heavier diners!) Two more days to go… To learn more about CatTipper and their Fridge Challenge week, be sure to view their website here. OK, we’ve been taking the Freshpet #FridgeChallenge for a few days now. It has been difficult. It’s not a hardship like many people face day in and day out in many countries around the world–after all, we know we’ll be back in that fridge next Sunday–but, nonetheless, it has been tough. Here’s a rundown of 10 things we really miss about our refrigerator: Cold water. It’s still in the 90s here so a cool drink is refreshing after our dog walks. We rely on well water so the water is cool…but it’s definitely not cold. Cold Cokes. OK, this is my indulgence. John has coffee in the morning but I’m a Diet Coke drinker. It’s just not the same when they’re room temperature. Nope, not a all the same… Ice. Yes, you see a common theme developing here. Eggs. I miss eggs for breakfast far more than I thought I would. I considered buying powdered eggs at the start of this challenge because I thought they’d be a poor substitute. Now I’m second-guessing that decision. Meat. As I mentioned in our first post, our typical diet involves a lot of fresh meat. We’ve substituted canned meat this week but it has been a poor substitute not only in terms of taste of in terms of the preservatives in each can. I wonder when the meat was canned. I try not to think about it much… Leftovers. With just the two of us in the house, we typically have leftovers available because I like to cook a large meal and save the leftovers. It saves both money and time. I’m not able to store leftovers anymore. We’re also not able to store doggie bags if we go out to a restaurant. We don’t go out to eat very often but, when we do, we typically ask for a doggie bag with either a meal to reheat the next day. We thought about going out last night but realized we wouldn’t be able to bring home leftovers so we ate at home. We might break down on Friday and go out. Convenience. On Wednesday nights when I do my DOG TRAVEL EXPERTS radio show at 7pm CT, John and I usually have a quick dinner before the show, often a salad and leftovers from the night before. I’m not able to do that this week. I’ll have to prepare dinner from out of the box. Although the boxed dinners are marketed as time-savers, the preparation is not as fast (and not nearly as nutritious) as a salad or leftovers from the homemade dinner the night before! Strawberries. Our home is air-conditioned but we don’t keep it that cool; I know strawberries wouldn’t last on the countertop. I miss them. Salads. We haven’t had a salad all week! Cheese. Yes, I bought some canned squirt cheese but it’s not the same…at all. End of discussion. To learn more about CatTipper and their Fridge Challenge week, be sure to view their website here. We don’t talk about it very often, but John and I don’t eat flour or sugar. We feel much better eating a diet that’s fairly low in carbohydrates. Instead of bread or (my downfall) chips, we eat salads, meat, cheese, eggs, and veggies. Instead of cookie and cake desserts (ahem, another downfall), we eat a lot of fresh fruit. And all of that is tough to enjoy without refrigeration... Since we do normally have our refrigerator filled with fresh meats, vegetables, and fruits, we don’t keep a pantry stocked with shelf-stable goods. Today, though, I headed to the grocery store to buy supplies to get us through the week of the Freshpet Fridge Challenge. We live out in the country so there’s NO running around the corner to the grocery store and no pizza delivery either! As with most weeks, we’ve got a busy week ahead so I shopped for the whole week as I typically do. Typically we start our day with a big breakfast of bacon and eggs along with some fruit. Well, not this week. I bought some breakfast bars. I’ve had them before and like them although I’m not sure about having them every day. Since both John and I work at home, we typically grab some cheese, nuts, and lunchmeat or leftovers for lunch. The nuts will still work this week…but that’s it! I decided we’re going to have to set aside our usual low-carb meals for the week so I broke down and bought a loaf of whole wheat bread. Lunchmeat was definitely out so I bought a big jar of peanut butter. Dinner shopping was more of a challenge. I turned to canned meats: canned chicken, salmon, and a strange little canned ham. I bought a bag of rice, some powdered cheese, some vegetables (sweet potatoes and corn on the cob…but no butter!) and fruits, but no salad that would need refrigeration. I broke down and bought some boxed mac and cheese. I really wanted some blueberries but they won’t make it on the countertop so I skipped them in favor of bananas. To learn more about CatTipper and their Fridge Challenge week, be sure to view their website here. CatTipper.com and author Paris P. are participating in our Freshpet Fridge Challenge by living without the refrigerator for seven days. We'll be posting CatTipper's experiences over the course of the week right here, so be sure to check back in each day. Or, you can follow the CatTipper's experience on their website here. For additional coverage, be sure to "Like" CatTipper on Facebook and "Follow" them on Twitter. As many of our regular readers know, besides being pet writers, for 20 years John and I have been travel writers. For our guidebook and magazine assignments, we’ve been lucky enough to travel to some pretty great places–from Borneo to Brazil, Jordan to Jamaica. Some remote areas meant restricted utilities, not in our hotels or many of the attractions that we visited and wrote about, but definitely for local residents. We’ve seen women chopping firewood high up in trees near the Pakistan border and children carrying water atop their heads in the tropics. We know that we are lucky…really lucky. Our home may be fairly simple and, in its own way, remote, but we take for granted so many conveniences that not everyone in the world enjoys…like refrigeration. Recently Freshpet, the company that makes fresh, refrigerated pet food, contacted us about joining in with several other bloggers and veterinarian Dr. Katy Nelson in the Freshpet #FridgeChallenge. We’ll all spend a week without using our refrigerator (except for our pets’ needs) and see how it impacts our lives, much as living without refrigerated food impacts the lives of our pets. Stay tuned this week as we live without a refrigerator. Every day we’ll bring you an update and discuss one aspect of life without the fridge!